Andy McConnell is one Andy McConnell is one of Britain’s leading authorities on glassware of all types & his books have covered the subject from ancient to modern. 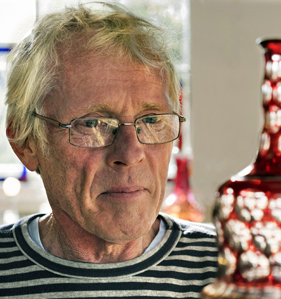 He was the first glass specialist recruited to BBC TV’s Antiques Roadshow for which he has now recorded 14 series. He lectures widely on glass & writes for journals as diverse as The Times & Daily Telegraph, Country Life, Homes & Antiques & Glass Matters. 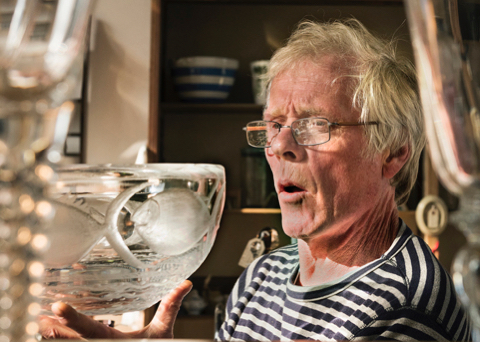 His 550-page opus, The Decanter, An Illustrated History of Glass from 1650, published in 2004, has just been entirely re-worked & will be published in November 2018: The Decanter, Ancient to Modern, 535 pages, 165,000 words with 3,000+ examples illustrated. Research for his 20th Century Glass, 2006, led him on a voyage of discovery across Europe & the US. This quest, involving visits to glassworks in Denmark, Sweden, Finland, the Czech Republic & Venice, resulted in his richly-decorated book, now sold out. Andy is a witty, spontaneous speaker who is delighted to share his knowledge & enthusiasm for the subject with audiences. He says that his mission is to engage, entertain & educate. He has never delivered the same talk twice, doesn’t work from notes & rearranges his slides for every talk. ‘I'm dead-serious about my subject, but a lecturer’s primarily responsibility is to take the audience along for the ride. By the end of a talk, nobody should be left regretting their decision to abandon a comfy fireside armchair for a hard seat in a hall’. Andy has Britain’s largest antique & vintage glass shop, Glass Etc, Antiques & High Class Junk, in his hometown of Rye, on the Sussex coast. He also owns around 25,000 pieces of glass & 30,000+ glass-related images, & admits that he need all the help he can get!